South Greek islands are representative of semi-arid drought prone areas and share similar global issues with other vulnerable communities. Climate change is expected to stress water resources, agricultural productivity and tourism development. This project, sited on two Greek islands and part of the Ionian Islands, aims to illustrate how climate changes can also disproportionately impact small rural European communities. Through reports and audiovisual material Rigas Zafeiriou, project proponent, will highlight how vulnerable rural island communities in the Mediterranean perceive and react to climate change and document their experiences with adaptation, focusing on livelihood security. Beekeepers and their Perceptions of Climate Change ? Reporting from Kythera island, South Mediterranean. Apiculture depends directly on climate conditions. Wind, rain, temperatures according to their variability, intensity and duration could determine the quantity and quality of honey production evry year but also the survival of bee populations. In Kythera honey production is of paramount importance: Kytherian honey is a traditional product considered to be of finest quality, famous all over Greece. The fine taste and aroma and its blonde colour are much appreciated, mainly due to the wild thyme bushes (thymus serpillum) and the rest of wild flora of the island. Currently it is produced by around 70 artisan beekeepers and it is a significant economic activity on the island. “Levantieres, Gregolevantes and Boriades duration has been reduced throughout the years” said A. Z., Kytherian beekeeper referring to the East, North-East and North winds respectively using the local terms for the winds. According to him, that has an impact on the life cycle of plants since the temperatures are remaining higher than normal and the plants cannot replenish the hours of lower temperature they need in order to be able to blossom and fructify during the spring and summer. Wild thyme bushes have small amounts of nectar, they dry out. Subsequently, quantity of honey production is dramatically reduced when the blossoming nectar is not enough. The majority of the beekeepers reported that the productivity per beehive has halved over the past 2 decades. Most of the Kytherian beekeepers experience more intense, frequent and prolonged heat waves compared to the past and the temperatures are generally higher. Remarkable are the measurements beekeepers take in order to adapt to this phenomenon. Movement of the beehives in shadowy areas, providing bees with plenty of water, installation of a “the third floor” on top of the beehives to give space for better ventilation and the placement of branches on the top of the beehives to create shadow are some of the adaptation measurements to protect bees. However, the vegetation of the island is greatly damaged under this environmental conditions and bees have less productive vegetation available to collect nectar or pollen from. Crucial is the reduced abundance of thyme in the natural vegetation, which is the basic ingredient of Kytherian honey due to wildfires, climate stress and other non-climatic drivers. It affects the quality of the honey and sometimes beekeepers cannot reach the 18% of thyme pollen in the consistency of the honey, which is required according to national regulations for the honey named 'thyme honey'. Hence, the honey cannot be sold as 'thyme honey' which is an important trademark for the Kytherian honey. Beekeepers depend on the income that they earn from selling the thyme honey, mostly through direct marketing, to the local people and the visitors of the island. Indeed, these experiences seem to agree with climate scientists, as Mediterranean basin is affected by the climate changes; studies in Greece underscored the rise of extreme annual temperature and the extent of dry period during the last decade (Tolika et al., 2008). Additionally, future estimations for South Greece show that the average number of extremely hot and dry periods will increase approximately 30 days by 2070- 2099 compared to 1961-1990 (Palutikof and Holt, 2004; Hanson et al., 2007; Mavromatis, 2010); thus prolonging the periods of 'effective drought'. Temperature projected for the same period is 3°C and more, more pronounced during the summer period (Mavromatis, 2010). Thyme honey is a summer-harvested honey based on early-summer flowering of the thyme bushes; therefore apiculture in Kythera is likely to be more severely affected by Climate Change. Apiculture is one of the main economic sectors of the island which is affected so directly from climate change. Important consideration could be how apiculture will develop in the future in order to cope with the estimated climate changes. 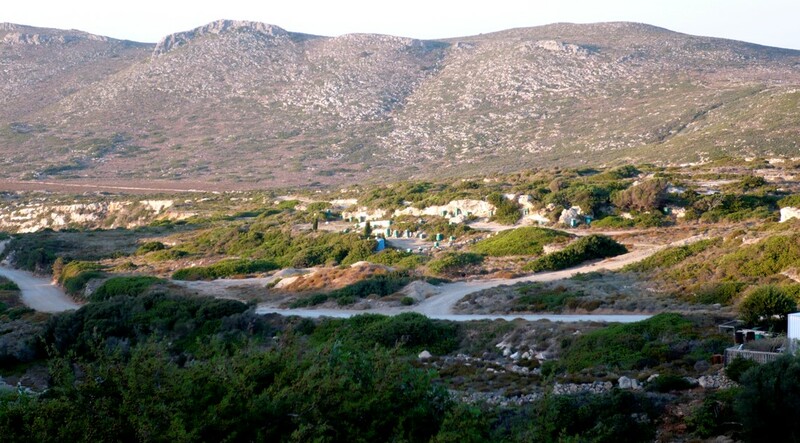 In an island like Kythera which is far from the main land and as every island face its own isolation, this consideration becoming stronger since beekeepers’ income depends on climate conditions and that makes them vulnerable to any climate change. © Extracting honey with the whole family in a small-scale manufacture in Mitata village, Kythera Island.